If you have a concrete sidewalk that is cracked or uneven, it not only looks bad, but it can lead to a fall or serious injury. The good news is the concrete does not have to be torn out and poured again to fix the problem. L.R.E. 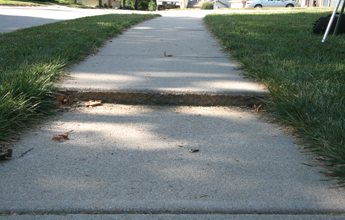 Ground Services, Inc. can raise your sinking sidewalk and prevent it from sinking further. 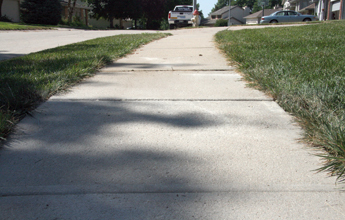 With PolyLevel® concrete lifting, we can make your sidewalk level again in just 15 minutes! If you have a sunken walkway or sidewalk, contact us today to request a free estimate for concrete leveling in Orlando, Tampa, Saint Petersburg or nearby. Some municipalities in Florida require home and business owners to maintain the sidewalks adjoining their property. If someone trips and falls on the sidewalk in front of your home, you might be liable. It’s important to check your city’s sidewalk regulations. Concrete lifting with PolyLevel® is a practical, affordable solution for concrete sidewalk repair. In addition to taking less time and costing you less, concrete leveling is far less disruptive to the landscaping. If the concrete is ripped out and repoured, the grass can be damaged from the heavy equipment and the removal of the old slab. With PolyLevel® concrete lifting, there's almost no waiting for the concrete to cure before you can walk on it. With concrete replacement, it usually takes about a day for the concrete to cure. Contact the concrete repair specialists at L.R.E. Ground Services, Inc. today to get a free estimate to raise your sunken sidewalk. We offer concrete lifting and leveling services in Lakeland, Sarasota, Clearwater, Bradenton, Kissimmee, Daytona Beach, Ocala and nearby.